I use a violet based bleach and the developer vol needed. I also add a packet of sweet and low to the bleach to help out with any stinging of the scalp. and low to the bleach to help out with any stinging of the scalp. I use the complete blondeme range. The steel blue and ice are toners in the range. You can intermix them (and others !) with a tonal base cream and developer to acheive different intensities and tones. To get my white look I use steel blue on its one 1:1 with its developer (2.5%) for 20 mins. If I want it slightly less intense I use equal quantities of steel blue and ice and developer 1:1:2. Blonde is a fairly new range (and fab) but if not I use bleach 6%/3% and schwarzkopf 9.5/49 as a toner (1:2 with 3%) and visually develop. sorry i'm not a hair geek but i was reading the thread and made me wonder.... i naturally have very dark hair and have spent the last 12 months going blonde professionally . i have now reached full blonde yippee! but up until march i was having foils in every 6 weeks i now have just a paste put on my roots every 4 weeks but was told this wasn't bleach it was much kinder to the hair and saves having all that bleach when having foils. so what is it that i have on my roots if it's not bleach? it lightens my roots really well it did sting the first 3 times having it done and a week after i would get a very flaky scalp but now it does happen at all and no stinging. sorry for butted in on the thread, my apologies just wanted to find out. H Lucy, Does she put you under a warm dryer with a cap over your hair? all i do is go in have this paste put on my roots ( root length less than 5mm) then sit under a heat halo type thing and i sit under that for about 30-40min . then hay presto my roots are done. my scalp isn't dry at all now it was just the first 2 times that i had it put on. it was as if it had burnt the scalp, it wasn't like lots of little flakes i'm taking quite big bits like peeling skin after holiday. sorry just trying to explain lol . it doesn't happen any more no tingling when it goes on. just wanted say pics taken about 4 months ago my hair is now blonde all over (the light blonde in pic). well, in my opinion. it's bleach. Your NL is not that dark. Judging by the pics and taking into consideration of lighting, I would say you are about a 5 or 6. Easy to lift it to a light blonde. Plus the pic looks as though you have more of a Natural ash tone to it which makes it that much easier to get a cool blonde. Thanks for the pics Lucy, the colour is gorge! I am in agreement with JD and minky the level it looks does look like a bleach. I am much lighter nat. but my hi-lift tint does not come up that blonde! You are not that dark nat. as JD says. Maybe she is using a creme bleach and does not consider that a bleach in the old fashioned sense as the lifting is more controlled??? i have had a look at my appointment card and it says on there Tint/Foils then every other visit Tint only. maybe this is what it is??. i've tried to do a close up pic of my roots as an idea maybe not a good time as i only had them done last saturday lol. 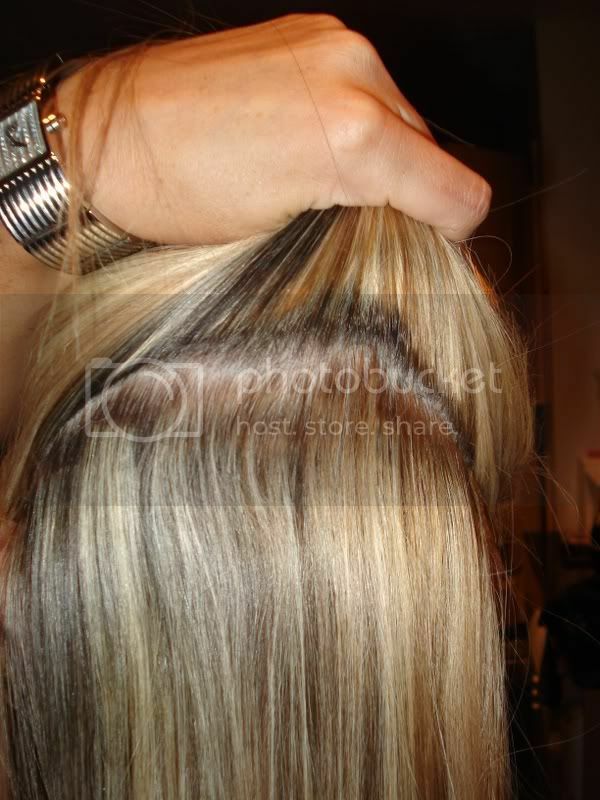 Then put the paste/Tint on your roots in between the foils ? Next time it would be roots only.